This report offers a comprehensive picture of the office furniture market in Poland, Hungary, Czech Republic and Romania, providing trends in office furniture production and consumption, office furniture imports and exports. Office furniture distribution channels are also examined. For each country the main economic indicators are provided. Forecast for 2014 is included. 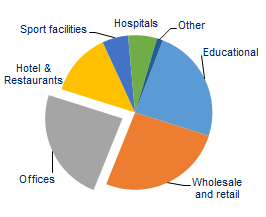 Office furniture imports and exports are broken down by country and geographical area. The office furniture supply structure is analyzed, with data on companies and employment. Short profiles are provided for the main office furniture companies, with data on office furniture sales and market shares of the leading local producers and of the main foreign manufacturers operating in Poland, Hungary, Czech Republic and Romania. The report is enriched by an in-depth analysis of the competitive system in terms of company size, manufacturing locations, financial ratios and product breakdown. The analysis of office furniture distribution channels covers: direct sales, dealers, large scale distribution, mail order and e-commerce. Data on the major office furniture distributors are provided. Addresses of about 130 office furniture companies mentioned in the report are also included. Countries covered: Czech Republic, Hungary, Poland, Romania. Products covered include: office furniture, office seating, contract, operative desk, executive furniture, filing and storage, wall to wall units, furniture for communal areas. Office furniture production is reported by segment (office seating, operative desks, executive furniture, office storage, wall to wall units). An analysis of the market potential focuses on data about building permits, 2020 growth for selected towns, available office spaces. Breakdown of non residential building surfaces. % shares on total square metres. - World office furniture consumption. Forecasts by region, 2014. Percentage change in real terms.